i have watched in awe as the professionals in their peloton, out on yet another long day in the saddle find it oh so easy to casually lift their tinted eyewear from the brow of the nose and plug it into the slots in their helmets. not only do the oakleys or rudy projects slide easily into place, but the darned things stay there for kilometre after kilometre of effortless whizzing. i just know that if i attempted the same thing, either one arm would fit into a readily available vent in the helmet while the other misses completely, snaps off with my less than effortless force, or folds back in place leaving the tinted lenses swinging stupidly across my face. the really smarmy whizzers plug the specs into the back of their helmet in an effort to convince the following that they've eyes in the back of their head, but yet again those tints remain in place, cool as you like. one can but admire the blase confidence of these mobile advertising hoardings, safe in the knowledge that the sponsor will replace any pairs falling into the path of graham watson's motorbike. i, on the other hand, still wear the same pair of rudy projects purchased three years ago (i have never once been accused of being fashionable) which, due to nearsightedness, have prescription lens inserts behind the tinted facade. this latter fact rather prevents any degree of coolness when it comes to slotting the rudys into any part of my catlike helmet, because should i ever become successful at so doing, i'd be unable to see where i was going. 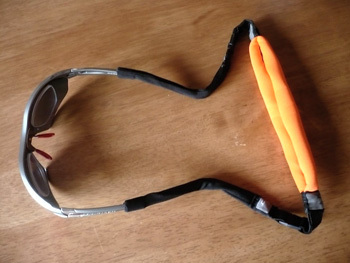 so while it has been defined as a major faux pax to wear cycling glasses inside the helmet straps, i find this a functional necessity to prevent knocking the former off if removing the latter first. i also have an inherent fear of the rudys falling off while bouncing across the remains of islay's roads, since not only would it hinder the homeward journey, but would leave a small hole in my bank balance paying for the replacements. so it was with much glee that i discovered hides, a device that seems, at the outset, much like a hi-tech version of those bits of braid your grandmother has attached to her bi-focals, enabling them to hang down in front of her cardigan while knitting sweaters that will subsequently be much too large at christmas. in this verisimilitude, the observation is correct, but the hides have hidden talents that you'd be hard pressed to recognise from the outset; or indeed from the attached hang-tag. with hindsight, this latter appendage does begin to make sense, but on first meeting the three-step graphic is perhaps less than clear. the slightly thicker folded section at the back of the strap (the orange bit in the photo) can be subtly unfurled, with a bit of practice, to cover the lenses; even the two sets featured in my myopia. thus covered, the outer and inner surfaces are intended to remain scratch-free if stuffed into a musette or a back pocket when normal vision is required for after dinner speaking. i believe that the fabric also allows for cleaning of fingermarked or splodgy lenses. 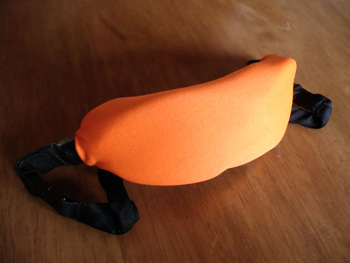 hides come in several varieties: the pair shown are the h2o version which will save your specs from sinking should you lose them overboard, a feature admittedly rather little used in the sport of cycling; there are also classics - visually similar but without the flotation characteristics. the classics sell for £6.99 while the h2os cost £10.99. in the usa, the classics retail at $7.95, while the h2o are $11.95. not a lot to pay, you must admit, for peace of mind in the peloton, even if a pair stuck in the helmet looks waaaay more cool.